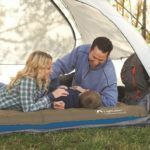 Facilities at a campsite are always cramped and most times, camping enthusiasts are prepared for it. But a camping toilet is a completely different ball game. This is one of those necessities that you cannot avoid. So wherever you may choose to go camping, deciding on the best camping toilet is important. Camping toilets are easily available in the corner store. But the problem is you are not shopping for safety pins. The toilets come in a wide range of options with a variety of features. Different models have different advantages. You have to match the features with your requirement. This is, however, not an easy choice. You have to take into consideration several factors and make a call based on it. The construction quality and the reliability of the toilet are extremely important. Often the absence of a proper toilet can even ruin your trip completely. But the question is how do you decide on what’s the best option for you? What are the most important features and what should be the basis of your budgeting? You need to take several factors into consideration before you make the final choice. Most importantly, your personal preferences matter a lot. You have to look for options that suit your requirements best and address your convenience most. We decided to make your search for the best camping toilet a lot easier for you. Here is our short list of a variety of options based on different features. The idea is to offer a compelling list of options that do not just excel in terms of quality and consistency of performance but are also unique in their own ways. We have also looked for options that also are sensitive to environmental challenges like the conservation of water and the like. The SereneLife Outdoor is undeniably one of the best camping toilets that you can opt for. It is rugged, reliable and sturdy. 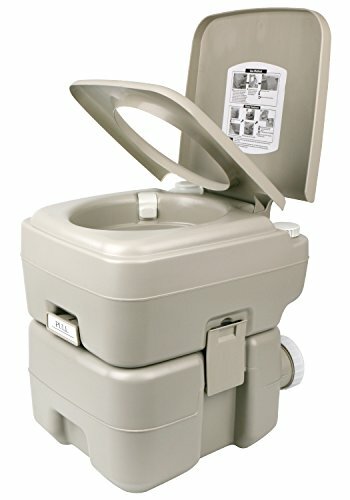 It is a well-designed travel toilet that comes with a level indicator, a three-way flush and rotating spout. 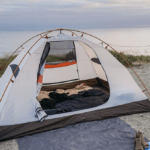 This last feature is what makes it a particularly must buy element for your camping trip. 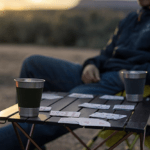 The rotating spout makes it a great companion on your camping or boating trip. It is designed in a way that you can be as comfortable with it outdoors as indoors. So no matter, wherever you may be out camping, this toilet makes it convenient and easy to respond to nature’s call. This tank comes equipped with a 3.2-gallon water tank. That is almost equivalent to flushing 50 times. As a result, it pretty much takes care of the daily needs of your family and more. This toilet also has a waste tank. The waste is stored in this tank, and it has a net capacity of 5.3 gallons. But that does not mean that you have to deal with the stored waste for too long. The quick and easily disposable system addresses this concern also very effectively. In short, it is an easy to clean tank. As a result, you don’t have to compromise with your hygiene or cleanliness in any way. The bowl is also rinsed and cleaned with fresh water and remains spick and span. The best part is, you do not need any external water connection or power supply. Both of these are hard to arrange for outdoors most times. Click here to see the best price. The seat designing is something you may have to adapt to. Some people find it way too small to be comfortable for extended use. 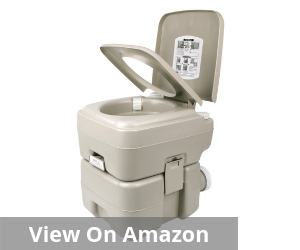 Whether you are out camping, on a boat, in an RV or just outdoors, this is one of the best self-contained camping toilets to go for. This one is sturdy with full-size seats making it appropriate for users of varying dimension and weight. This toilet is equipped with a seat cover and comes in a matte finish look. This is rather useful in concealing scratches if you end up having any. This is a rather heavy duty portable toilet. It has a 3-gallon water tank and a 5-gallon waste water tank. 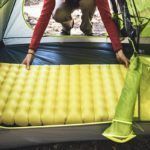 But the whole thing is available in one piece, and that helps in making it a leak-proof option ideal for repeated use outside of the home. 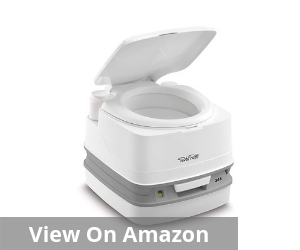 What is even better, you do not have to worry about assembling this toilet after buying. It comes fully assembled. 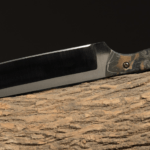 The simple flush technique and superior construction quality are its most striking features. The flush which mirrors a conventional one is easy to use and also effective. This also does a commendable job of cleaning the pot instantly. The full-size seat as well as the overall structure is rather sturdy and ensures that you can use it any number of times without worrying for potential damage to the body. Click here to see the best price. 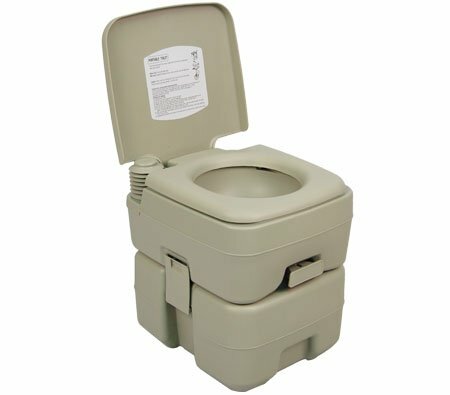 This durable polyethylene variant is undeniably one of the best camping toilets that are available at the moment. 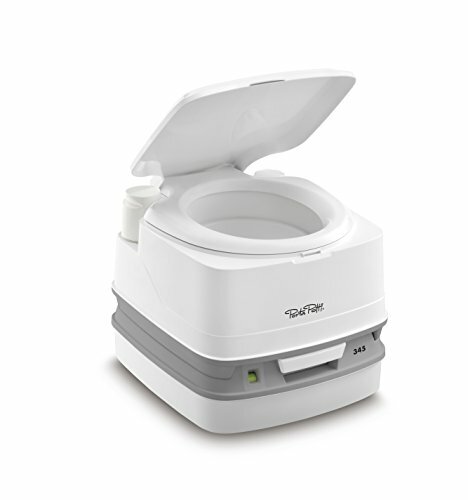 The bellow type flush and the quality of construction make it a hygienic and easy to use option for an extended period. The water tank and the waste tank are secured to the toilet using side latches. This is a particularly interesting feature as this is what makes it relatively leak-proof and easy to navigate for an extended period. Moreover, it has sealed valves. It limits the chances of a leak and also makes it smell proof. No more worrying about bad odor, the moment someone needs to take the dump. You do not need any external tools to fix it either. This comes completely assembled and can be easily carried from one place to another. This toilet does not require any external power or water connection. The freshwater tank holds enough water to guarantee 50 or a little more flush and the waste tank has about 20-liter capacity. So even if you are traveling in a relatively big group, this toilet can address your need quite effectively. Click here to see the best price. This is a refreshed modern variation and features prominently in the list of the best camping toilets available. 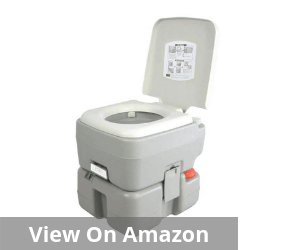 It is equipped with an exclusive rotating pour-out spout and a standard lid attached to the toilet. 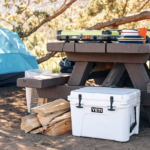 This is clean, hygienic and easy to operate for any type of outdoor trip. It is lightweight and rather small in dimension so it can fit in rather effectively under the bed in your camper. So when you are out in the wilderness or on the road, this camping toilet easily obliterates the need to go out dressed in the middle of the night to use the public toilet. It is easy to clean and maintain, and you can use simple home products like baking soda to deodorize the toilet for extended use. It is sturdy and stylish and comes with an ergonomically designed handle. 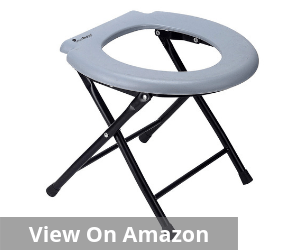 This makes carrying the toilet rather convenient when you are moving from one place to another. It is relatively leak proof and ensures that you have a fairly hygienic potty experience even if you are out in the wilderness right amidst nature. Click here to see the best price. 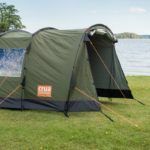 The Green Elephant is one of the best camping toilets because this is an affordable way to get comfortable even in the wilderness. So what if you are in the wilderness, when nature calls, the Green Elephant makes it almost as enjoyable as you can imagine in such condition. This is a lightweight, comfortable and folding chair that can be easily carried to any trip anywhere. The seat can be easily covered with a plastic toilet bag that can be disposed of after every use. So you do not have to deal with the whole hassle of cleaning the toilet after every use and deciding who does the dirty job. So sanitation, cleanliness, and hygiene levels are maintained adequately and this potty seat ensures that you have easy and worry-free experience while on the go. This toilet seat is just 3.5 pounds and is relatively lightweight compared to a lot of its peers. 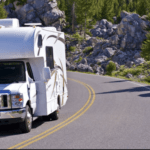 As a result, you can easily carry it in your camper or your car and travel any distance that you choose. This is particularly effective for those who cannot bend too much and for those who are relatively heavy build. It has a premium load bearing ability adding to its versatility and flexibility. Click here to see the best price. Not convenient if you are not carrying the replaceable toilet bags. It can be rather awkward to use without these bags. Relative price to effectiveness ratio not very favorable and some users have found it pricey for the features that it embodies. Therefore, you can understand that various factors need to be considered. 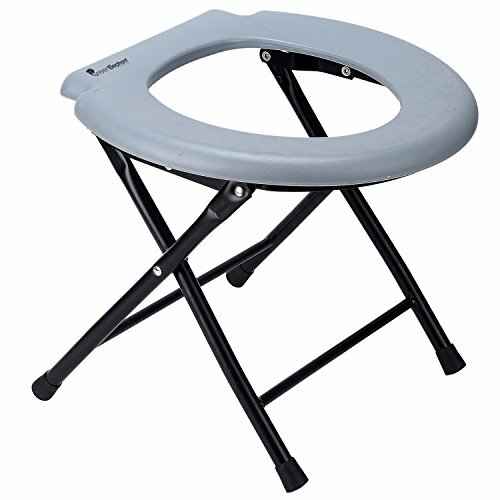 The best camping toilet is not just a necessity; it needs to be comfortable as well. 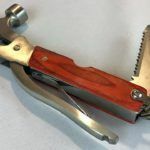 This is one of those essentials, without which your camping trip can be quite stressful and half as enjoyable. So comfort is one of the factors that we have already discussed. But that apart, you have to pay attention to many other small details too. Ultimately, they play a crucial role in determining how worthwhile a buy it is. 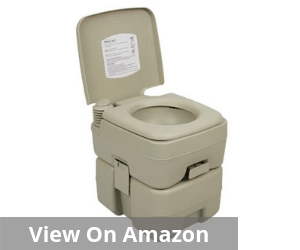 Budget: When you are looking for the best camping toilet, they are available in a varying range of prices. Some are north of $100 while many may be hovering close to $50 range. Think about your requirements and match it with the available features. The idea is to optimize the features without overshooting your budget. Therefore affordability is a crucial factor to consider. 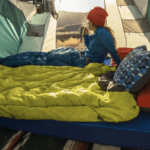 It will determine the extent of features and range that you are comfortable with and how heavily you can invest in a camping toilet. In many ways, this also affects your decision in terms of the locations that you choose. Design: This is another factor to consider when comfort is your buzz word. 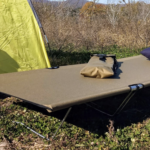 The designing of the best camping toilet is important not just in terms of the way your seat is designed but also how well it helps you maintain a hygienic and clean environment in the wilderness. The design element plays a crucial role in this context. It goes on to determine the overall efficiency of the toilet and the extent to which you can leverage your convenience. 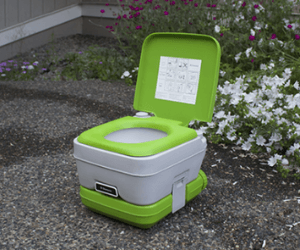 A well-designed toilet can go a long way in making your outdoor trip memorable. Durable: It goes without saying that you will have to choose an option that is durable and withstand the basic wear and tear. The load-bearing capacity of the toilet also needs to be taken into consideration. It is worthwhile that you make a mental headcount of the potential users and then look for suitable options in that range. Remember different types of toilets have varying load bearing ability, and you need to take a call based on your needs. The idea is to match efficiency and necessity with strength for best results. Innovation: As humans, we are continually looking for better and bigger options. Therefore, it is needless to mention that even when it comes to looking for the best camping toilet, innovation is a crucial factor. Manufacturers are incorporating a variety of innovation to boost the hygiene levels and also the overall efficiency. The trick is to identify the one that best matches your necessity over the long-term. You have to choose carefully in this context. Water Consumption: Let us not forget our responsibility towards the environment either. 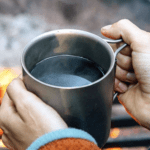 Remember, when you are camping, potable water is in short supply. I am sure that you do not wish to use a good part of it washing your toilet. So the best option is to go for camping toilets that are water efficient and can help you deliver consistently reliable performance without using a lot of water for a sustainable period of time while camping. The options for the bets camping toilet is never simple. It needs to take into consideration a variety of factors and thorough examination. In case you are confused about what’s best for you, refer to this ready list of some of the most reliable, affordable and innovative options available now. 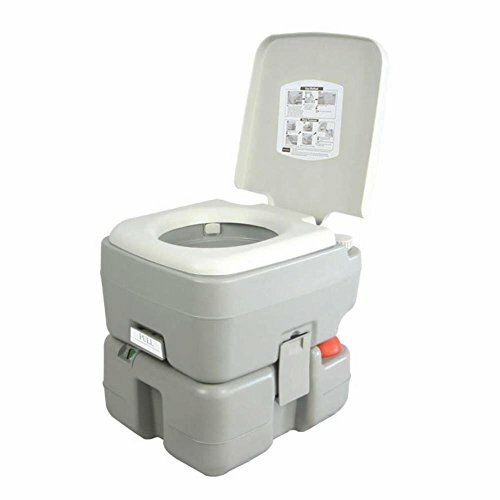 I can assure you will be able to identify the best camping toilet that suits your necessities.